You can import paper texture presets you previously exported from Harmony. 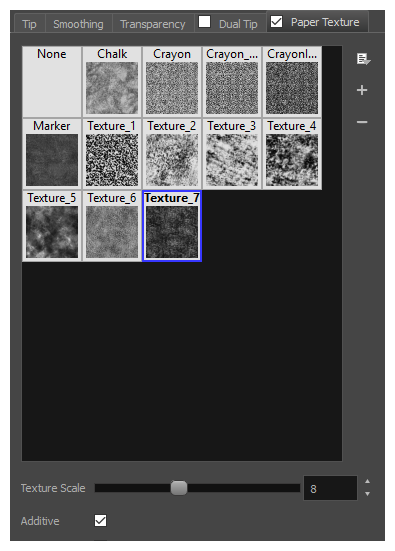 Click on the Paper Texture menu icon and select Import. In the browser window that appears, navigate to and select the .xml file in which you exported your paper textures. In the Import Tips and Textures dialog box appears. If the selected .xml file also contains brush tips, they will be selected for import along with the paper textures by default. 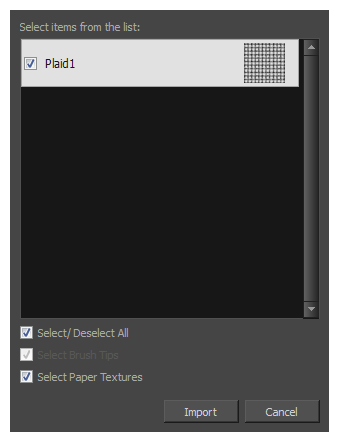 If you only wish to import the paper textures, uncheck the Select Brush Tips option. The imported paper textures will appear in the Paper Texture Library.